The couple married in a ceremony at Windsor Castle on Saturday, May 19, 2018. 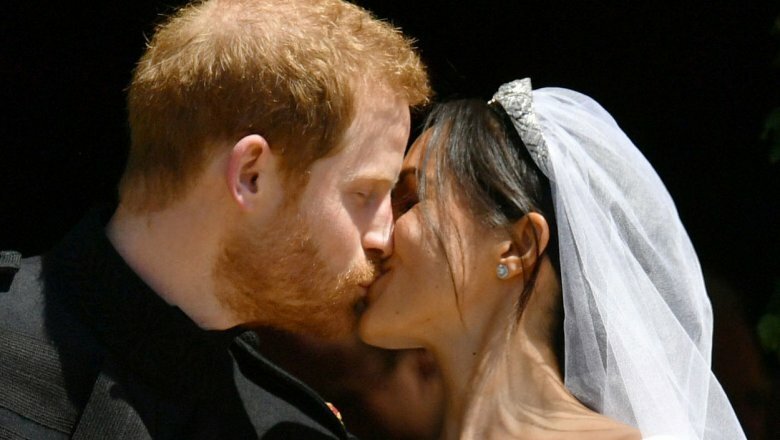 Harry and Meghan said their "I do's" during their wedding at St George's Chapel in front of Queen Elizabeth II and 600 guests, as reported by BBC News. 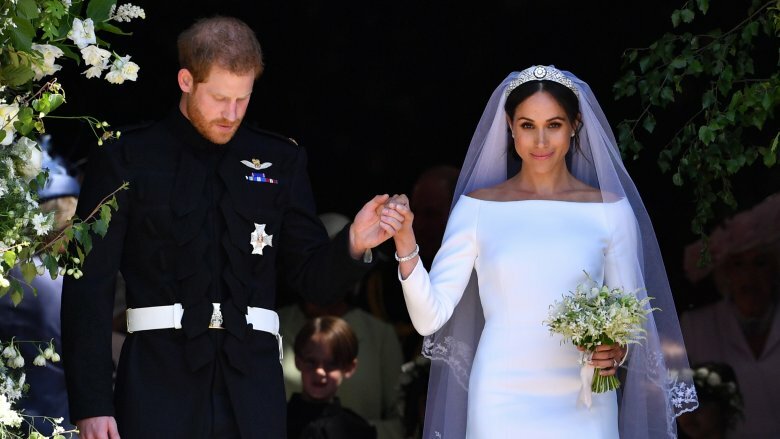 Wedding guests included not only members of their families and Harry's fellow royals but also a number of celebrities, such as Amal and George Clooney, David and Victoria Beckham, Serena Williams and husband Alexis Ohanian, Oprah Winfrey, Priyanka Chopra, and James Corden. Many of Meghan's former Suits co-stars, including Patrick J. Adams, Sarah Rafferty, Rick Hoffman, Gabriel Macht, Gina Torres, Abigail Spencer, and Jacinda Barrett, were also in attendance (via People). Meghan, whose wedding dress was designed by Clare Waight Keller for Givenchy, was already expected to make a feminist move by walking alone down most of the aisle. However, she also omitted the word "obey" from her vows. Likewise, Harry also broke tradition by choosing to wear a wedding ring. According to BuzzFeed News, before their wedding service started, Harry told his bride, "You look amazing. I'm so lucky," after she walked down the aisle. The two newlyweds will now be known as the Duke and Duchess of Sussex. As Nicki Swift previously reported, Harry and Meghan announced their engagement in November 2017. "His Royal Highness and The Prince of Wales is delighted to announce the engagement of Prince Harry to Ms. Meghan Markle," a statement from Buckingham Palace read at the time. "The wedding will take place in Spring 2018." It was later announced that they'd wed at St George's Chapel, Windsor Castle on May 19. Meghan's family has made headlines in the months leading up to her big day — most notably, her father, Thomas Markle. He was expected to walk Meghan down the aisle, but, after he was discovered to have staged photos of himself preparing for his daughter's wedding with paparazzi, he reportedly decided not to attend, though he later backtracked and shared that he would be going after all. However, he then announced that he would not be able to attend, as he'd suffered a heart attack and needed heart surgery, which he underwent on Wednesday, May 16. Meghan later released a statement, confirming that her father would not be attending her wedding. "Sadly, my father will not be attending our wedding," she said via Kensington Palace's Twitter account. "I have always cared for my father and hope he can be given the space he needs to focus on his health." On Meghan's wedding day, E! News reported that Thomas watched the ceremony on TV. He told the celebrity news site, "My baby looks beautiful and she looks very happy," adding, "I wish I were there and I wish them all my love and all happiness."